Rogue is growing by leaps and bounds. 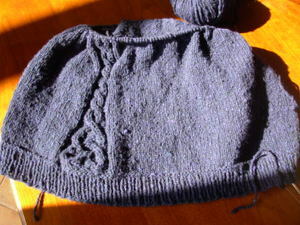 I love the stockinette interspersed with cables. It's nice to have long stretches when you don't have to think too much, punctuated by a section that does require attention. I started a sleeve the other day so I would have something smaller to take along in the car. I've also picked up another project that's been sitting around for a while. I'm not even sure if I have posted a photo of these before. These are the Embossed Leaves socks from Interweave Knits (now the pattern is in their new sock book) in Socks that Rock colorway Titania. 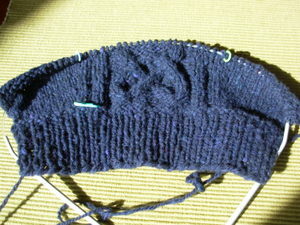 This is one of the colorways from the Rockin' Sock Club. I love this pattern and this is the second time I've done it. 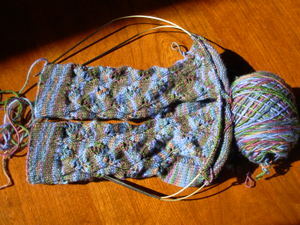 I blogged about the first pair last February. This is one of the headlines from yesterday's paper. 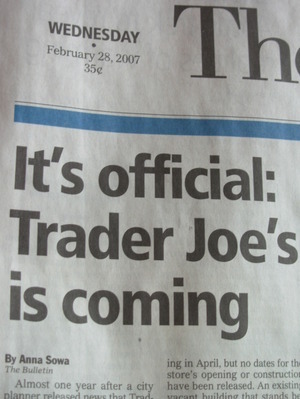 There have been rumors about Trader Joe's for the past year. You should have seen me doing the happy dance! Everyone I know here stocks up on Trader Joe's food when they are near one, on a trip to the other side of the Cascades. It'll be so nice to have one here. My family first discovered TJ's in the early 80's when we moved to southern California. We used to go to the one in Newport Beach, which may have been one of the first. We loved to get their nuts and chocolate. Now, they sell all sorts of stuff including great frozen entrees, produce and even sushi! YUM! 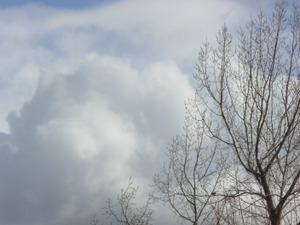 Lastly, this is a photo Chloe took yesterday. It fits nicely with the Project Spectrum colors of blue, gray and white.